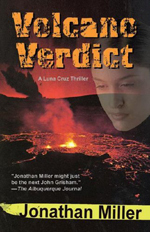 Author and attorney Jonathan Miller has published 11 books since his 2004 debut novel. 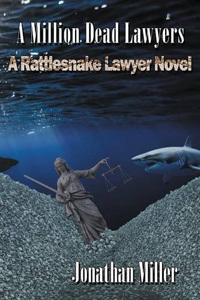 A graduate of both the University of Colorado School of Law and the American Film Institute, he draws on his unique experience to create the award-winning Rattlesnake Lawyer series. A Million Dead Lawyers (Casa de Snapdragon Publishing, 2015) is his ninth book in that series, the first of which earned him the distinct nickname of The Rattlesnake Lawyer. You can find him at his website RattlesnakeLaw.com. What is your elevator pitch for A Million Dead Lawyers? Saul of Better Call Saul in The Hunger Games. In 2112, there are no attorneys, and all verdicts are rendered by computer. Albuquerque lawyer Sam Marlow is dragged from the past to handle the first actual jury trial in nearly a hundred years. The governor’s son is accused of killing his wife, and the whole system lies in the balance. Nothing is what it seems, and yet some people seem strangely familiar. Is the Albuquerque of the future ready for a rattlesnake lawyer? Trying to imagine Albuquerque in the future. Also I wanted to write a science fiction/legal thriller that worked in both genres. You normally write legal thrillers set in present day. What made you add the science fiction element to this novel? I wanted to explore a genre that I grew up with. I actually wrote a science fiction manuscript in long hand when I was in 8th grade. I still have it. Deep down, I also wanted to explore my own mortality. By definition, science fiction lets you think about your impact in the world after you die. Tell us about your main protagonist. Will your friends and family recognize you in your main character? What about your antagonist? Sam Marlow is a darker version of me. He is a far better lawyer than I will ever be, but he also has far more issues. The antagonist is the daughter I’ve never had. Why did you decide to use New Mexico as the setting for the book? I try to write what I know. It was also fun to imagine Albuquerque in the year 2112. In my vision, it’s about 50 percent the same, but the elite have access to more technology like flying cars and genetic engineering. What makes this novel unique in the mystery/thriller/sci fi market? 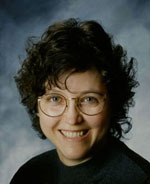 I am a trial lawyer who has done more jury trials in the past year than just about anyone else in New Mexico. The trial in the book is a fairly accurate depiction of a real trial that’s spiced up with some scientific elements. The book explores the nature of humanity—what is a jury of one’s peers if you are genetically engineered? Is there a scene in A Million Dead Lawyers you’d like to see play out in a movie? The scene where Marlow confronts his daughter and has to take responsibility for creating a monster. On the day I graduated from film school at American Film Institute (AFI), after my first novel Rattlesnake Lawyer was published, I gave a copy of the book to the professor who had suggested I drop out. What did you learn at AFI that you now apply to your fiction writing? You’ve written nine books in your Rattlesnake Lawyer series. Which characters from the series have you enjoyed writing the most? Dan Shepard is the only character where I use the first person when I write. I also liked writing the young girl Dew. As I’ve said, she is the daughter I’ve never had. Share a bit of your journey to publication. 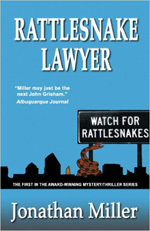 I started Rattlesnake Lawyer as a public defender in Roswell. I had an agent within my first month! My boss wasn’t happy that I was writing about my work. I was told that if I wrote about anyone at the office, I would be fired. If I wrote about any client confidence, I would be disbarred. I was just fired. The manuscript was optioned as a potential TV series within the first year without being published. It almost became a show on several occasions. Still, all the publishing houses said the manuscript was “not compelling” and passed. I moved out to LA and attended the American Film Institute to learn compulsion. While interviewing for potential jobs, I met a lawyer who was also a publisher. He published the book. Looking back to the beginning of your writing/publishing career, what do you know now that you wish you’d known then? To have my books professionally edited more than once before I submit them. What are your strengths as a writer, and what do you do to overcome your weaknesses? My strength is the ability to see interesting scenes in everyday life. My weakness is that I am probably dyslexic, and my books have numerous errors which I can’t always see. I have to use a good editor. There is a story everywhere you look. Of the 11 books you’ve written (fiction and nonfiction), which one did you enjoy writing the most? Volcano Verdict. Page 220 is my favorite page of writing. It’s where I have my first abrupt genre shift. Up to that point, the reader assumes Luna Cruz will inevitably be handling a jury trial like Tom Cruise in A Few Good Men. Suddenly, the book shifts into a mob story, and Luna is Johnny Depp in Donnie Brasco. I also like the “Tet Offensive” scene in La Bajada Lawyer because it’s so theatrical. I even had two actors do a staged reading for YouTube. If you had an unlimited budget, how would you spend your money for marketing and promotion of your books? What marketing techniques have been most helpful to you? I would do more internet marketing. Direct sales at book stores or after lectures are still the best way to sell a book to someone who will read it. What are the rumors of “Rattlesnake karma” all about? Some of the characters in my novels are based on actual people, and the universe seems to reward people associated with the series. The cover model for Navajo Repo is a Native American named Cheyenne Gordon who grew up on the Hualapai reservation in Arizona. Since she appeared on the cover, she has become an international model. We probably couldn’t afford her now. The character of “Gollum” that has appeared in several of my books is based on Louis, a man who works out at my gym. Gollum also appears in A Million Dead Lawyers in the year 2112, and hopefully that will bring the real Louis a good helping of Rattlesnake karma. Has your experience as a lawyer helped or hindered you in your writing life? Both. Law is a full-time job and it pays the bills. I have to devote my utmost energy to my law practice. Who are your favorite authors, and what do you admire most about their writing? I loved John Nichols because he taught me how to write about New Mexico. I like half of John Grisham’s work. When’s he’s good, he’s very good, but he’s poorly edited. I learned about writing surprise endings from Isaac Asimov. I learned about writing humor from Douglas Adams. What advice do you have for writers who are still striving for publication? Keep writing. Don’t give up. Write from the heart, but edit from your head. When I listen to books on tape, it’s like having a companion riding with me across the desert. That companion has to be someone who makes the ride more pleasant, even if the destination is not a happy one. I’m currently working on Rattlesnake Honeymoon. It’s a Dan Shepard book with elements of a conspiracy thriller.